The 5.5 Carat Hamilton Halo Elongated Cushion Cut Micro Pave Cubic Zirconia Eternity Solitaire features a 5.5 carat 11mm x 9mm custom cut emerald cushion center framed by a halo of micro pave set round cubic zirconia. 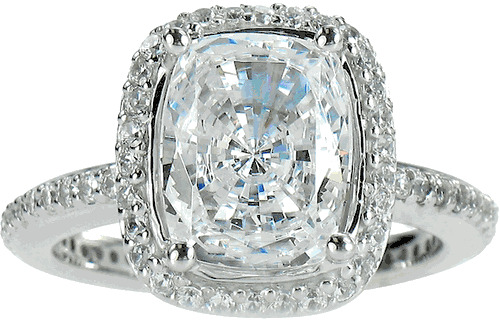 The elongated cushion cut is also known as an antique cushion cut, cushion cut rectangle, cushion emerald, or cushion oval that features an exclusive cut in a premier shape that is a combination of the elegant cushion cut simulated diamond cubic zirconia with an oval, elongated or emerald cut shape. The cushion cut emerald is set in a raised fashion that adds a beautiful height to the ring. 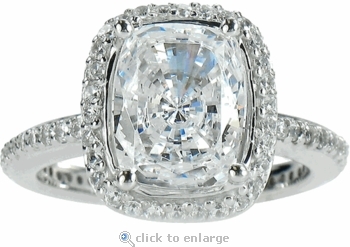 The basket under the center stone and the eternity style shank is accented with micro pave set round cubic zirconia. Ziamond features the finest hand cut and hand polished original Russian formula cubic zirconia set in solid 14k gold or platinum mountings. The Hamilton 5.5 Carat Emerald Cushion Halo Solitaire includes a total of approximately 7 carats in total carat weight and the shank measures approximately 2.5mm in width. For further assistance, please contact us directly at 1-866-942-6663 or visit us via live chat and speak with a knowledgeable representative.